In the Japanese Middle Ages the ancient blacksmiths used to perform purification ceremonies before forging any new blade. They used these rituals to gather the benevolent spirits and to make the birth of the new katana swords favourable. 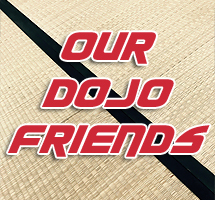 The creation of a new katana, in accordance with the traditional methods, can take months. The first step is the construction of an unique model of furnace called “Tatara”, similar to a rudimentary clay blast furnace in which charcoal and iron sand are burnt for 3 days and 3 nights. With this complicated procedure the iron blends in with the coal producing the steel, while many of the original impurities are removed. But we have to say that the mineral and iron sand deposits, at the ancient Japanese blacksmiths’ disposal, supplied a very low quality metal compared to the Western ones. This made the elaboration of particularly refined techniques necessary in order to remove the various impurities. The heart of the generated steel is called “Tamahagane” which means “steel jewel”. 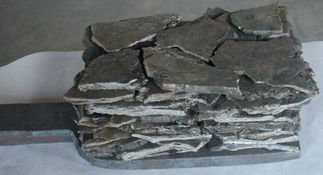 It consists of an iron and carbon porous block still containing many impurities. 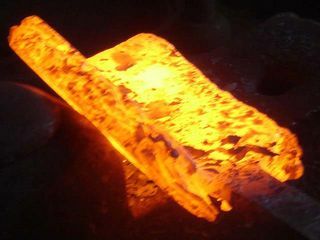 The remaining material, a carbon with a lower steel percentage, is used anyway as a metal reserve for the smoother parts of the blade, otherwise its content can be modified by the addition of some sections of the Tamahagane. Also the Tamahagane is fragmented into little cubes that, according to their colour, are divided depending on their carbon content. Then the cubes are wormed up and hammered at until they become thin sheets. Their features, as the carbon quantity or the level of impurities, have to be easily recognised. The best sheets are selected to create the blade’s external covering, the Kawagane (leather-steel) and the Hagane (blade-steel). These sheets are put one on top of the other, heated up and melted together by percussions. This procedure (the heating and the percussion) has to be repeated many times in order to flatten and straighten the steel block which, thanks to this specific process, also starts to loose several impurities. At this point the plank is ready to be forged; it is heated up once more and at its midpoint the blacksmith carries out an incision that is used to fold the steel plank up. Once this is all done, the whole is warmed up and beaten again many times until the two layers, flattened till they regain their original dimensions, are completely melted together. This process is done again and again for about 6 times and the result is a steel plank formed of thousands of overlapping layers since every time the steel is folded the number of the layers doubles. At this point the plank is cut in 3 pieces, but to create a samurai sword 4 pieces are necessary (therefore one of the pieces has to be recycled from another block). The 4 steel planks are put one on top of the other, heated up and melted together by percussions. The whole is folded again and welded for at least 6 times but the material, when is heated up, looses its carbon step by step. Indeed the carbon burns in contact with the oxygen so, advancing with the procedure, the steel will loose its carbon but not in an uniform way and, in the end, the block will be made of thousands of steel layers, each of them with a quite different carbon content. The final product of this long process is a steel plank composed of thousands of overlapping layers with a few millimetres of thickness, actually we talk about a “molecular” thickness for each layer. Depending on how the steel is beaten and folded (always in one direction or in different directions), we’ll obtain a different frame on the steel’s surface (hada). At this point the blacksmith begins with the construction of the Shingane (heart steel), starting from a low carbon steel that is moulded, folded up and hit for about 10 times in order to further reduce the carbon quantity and expel the impurities. Now it’s time to bring everything back together, the Kawagane is bended as a U and the plank of Shingane is inserted in its inner part. The whole is heated up and hit once more until the two layers are completely melted together. This phase is particularly critical, since the welding has to be very well done and the beating must not displace the two components (the kawagane outside and the shingane inside). The result of this complicated procedure is a blade with an extremely hard covering that can also be easily sharpened, and a very flexible heart that can easily absorb the shocks without breaking. The one described is the simplest technique but sometimes more complicated methods are used for katanas and often is employed a stiffer steel than the Kawagane (leather-steel): l'Hagane (blade-steel) particularly rich in carbon, therefore extremely hard. Of course also this steel is folded and hit properly. 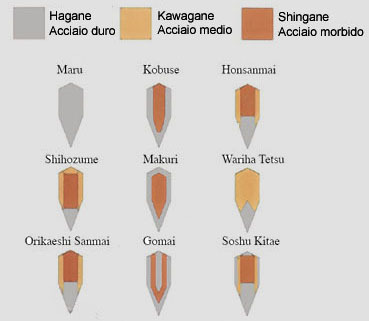 Behind the Hagane sharp edge we can find a Shingane (heart-steel) plank and a Kawagane (leather-steel) covering on the sides, but other combinations were possible. They say that Masamune could use up to 7 different kinds of steel to make his samurai swords. 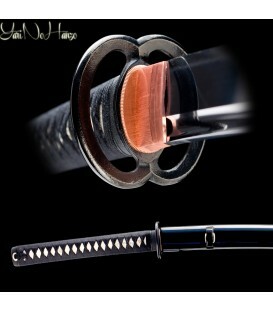 On the other hand the tip of the sword (the kissaki) could be made only of a hard steel (Hagane/Kawagane). 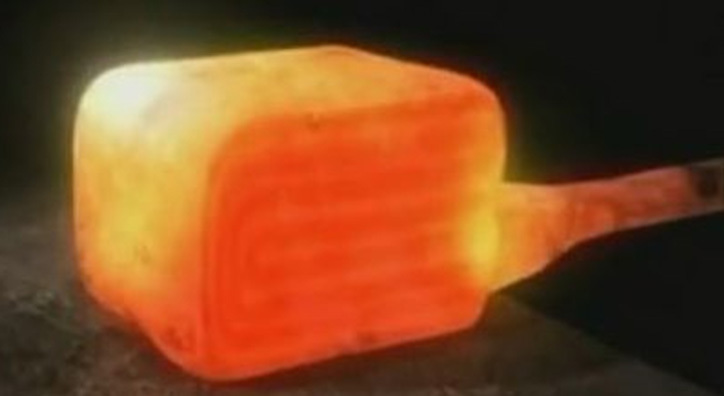 At this point the future blades are heated up again and hit till it acquires its ultimate shape, the Nakago and the tip (kissaki) are shaped too. Now we have to face the most critical moment: tempering the red-hot blade, dunking it in water or in oil (at times). The tempering in water is quite difficult and it stresses the katana because the huge temperature leap modifies considerably the molecular structure and the shape of the entire plank. This temperature leap changes also the curve of the blade and highlights the possible construction flaws by splits and cracks. The carbon makes the steel very hard since its big molecules interfere with the iron layers, preventing them to roll one on the other and the tempering process amplifies this effect. When the steel is heated up, the iron’s crystalline structure flakes off and the iron atoms mix up with the carbon ones. If the steel is cooled down slowly, the iron atoms recreate their crystalline structure, pushing aside the carbon atoms. On the other hand, if the cooling down is fast the carbon atoms are imprisoned into the iron’s crystalline structure altering it and making it irregular. In this way the iron layers roll one on the other with great difficulty but this increases the hardness of the steel considerably. 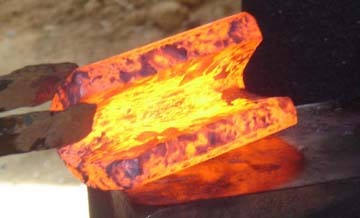 A hypothetical further heating can destroy the tempering; this used to happen when a fire occurred and tempering the blades of the samurai swords again was necessary in order to make them fully functional. Anyway the worth of the katanas was halved since the original features were lost relentlessly. At this stage the sword is subjected to the second preparatory tempering: the blade is wormed up in different ways (the blade and the sides are wormed up more than the heart and the back) and is dunked in water. Now it’s the moment to temper the edge and to create the Hamon, the curvy line that separates the edge from the body of the katana and that reveals the two sections at different temperatures. 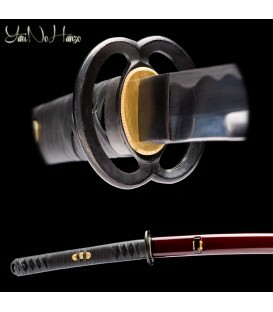 The Hamon is a curvy line that is visible along the blade and is formed when the samurai sword is cooled during the tempering process (yaki-ire). 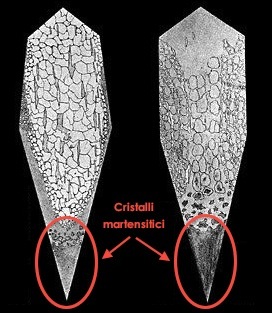 During the cooling down the martensitic crystals, which are formed in the steel along the edge, fixate developing the Hamon. These hard particles, called “nie”, are concentrated in particular on the area immediately underline the Hamon, called ha-saki, making it the hardest part of the katana, able to keep a very sharp edge over time. Often the variability of the Hamon is considered synonymous of quality: actually the main feature of the Hamon is not its pattern but its uniformity along the blade. To obtain this effect the blade of the samurai sword is covered with clay, but not in a uniform way, because the clay is an isolating material and where there is more clay the area results less tempered, vice versa where there is less clay the area results more tempered. The Hamon, which at the beginning was rectilinear, during the centuries has become a decoration of the blade and has acquired very beautiful shapes of artistic interest. 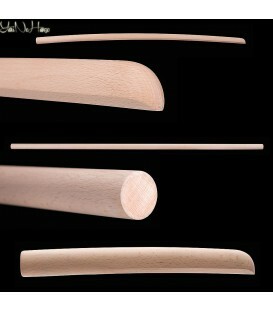 However the fundamental types of Hamon are four: Shugua (this type of hamon is a straight line situated more or less in the middle between the shinogi and the edge of the sword) Gunome (is characterized by an half-round waves hamon and presents itself with lightly enlarged “picks” and less marked “valleys”), Notare (it’s a kindly wavy pattern. The Notare hamon is divided into o-notare, if the height difference between the “picks” and the “valleys” is considerable, and ko-notare when the undulation of the pattern is only a little accentuated. In many cases this kind of hamon is inserted in a more complex framework and therefore is called notare-midare) and Choji (it’s called after the cloves because this hamon looks like them. It’s often confused with the gunome-midare (see below), but in the choji-midare the "valleys" are narrower than the "picks"). In the most valuable samurai swords, between the Hamon and the rest of the blade, we can also find the Utsuri, the Hamon shadow that is an area of a different colour which appears to delimit the edge of the Hamon itself (see the picture above). At this point the sword is given to other blacksmiths specialized in polishing. Also the polishing process is very long and can take months, starting form rough files and ending with thin paper sheets rubbed down the edge of the katana with incredible patience. 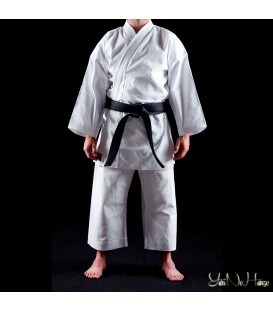 The final result is a samurai sword with an edge hard like a diamond and a body that’s still very flexible; Katanas assembled through the traditional technique can cut a sheet of silk fluttering in the air or easily split an armour. The surface of a real samurai sword, both original and reproduction, is never completely burnished but it shows a faint frame called Hada (frame) or Jitetsu (kind of frame), and it is the mark left by the many folds carried out. In addition to this one, we can find other marks and shadings that are used by experts to date and attribute the blade to a certain school or to a certain forger.